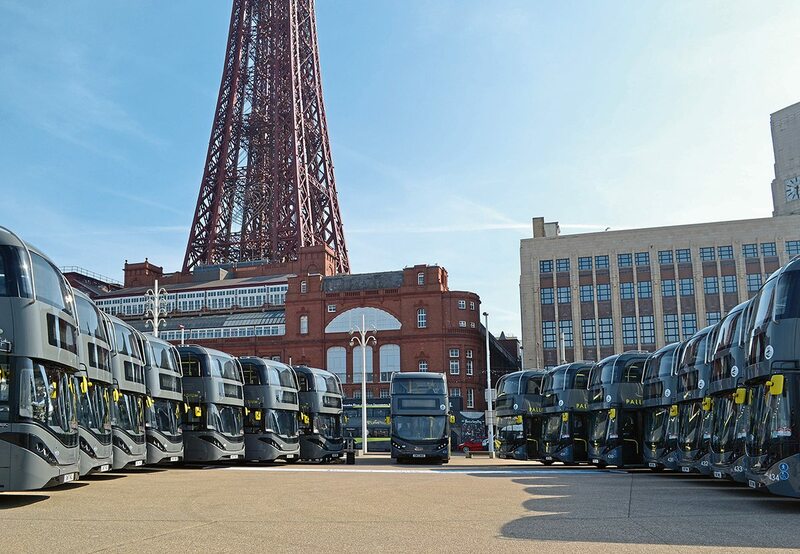 The latest 25 ADL Enviro400 City buses in Blackpool’s Palladium livery, were officially launched at a ceremony on the town’s seafront, in front of the iconic tower. 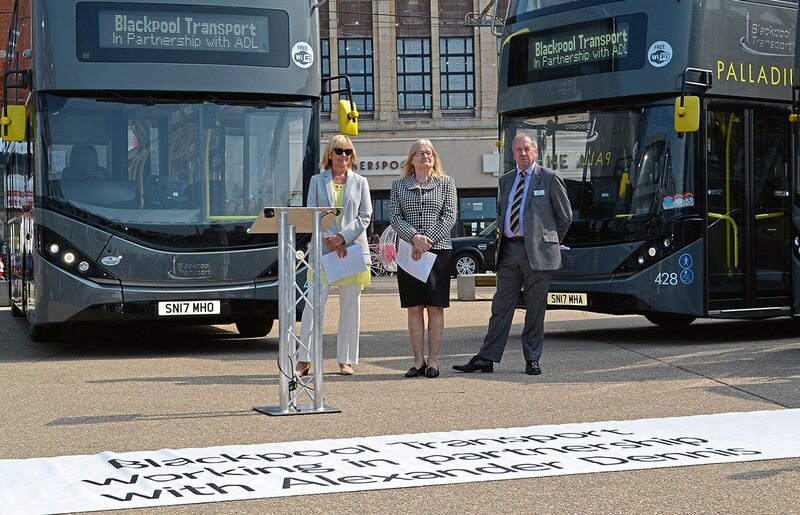 On a warm, sunny Sunday afternoon on the Tower Festival Headland, members of the public and the press, along with representatives from Alexander Dennis Limited (ADL), Blackpool Transport and Blackpool Council, gathered to witness the official launch of the latest batch of ADL Enviro400 double deckers. 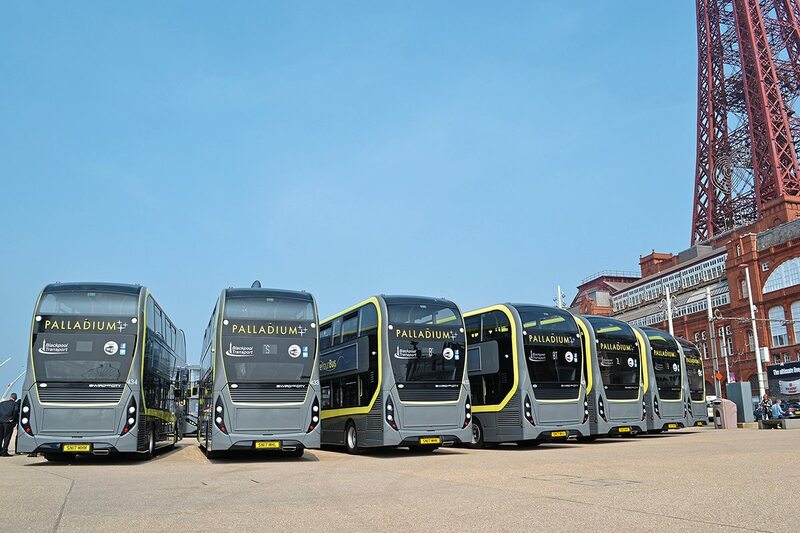 Earlier in the day, the new Palladium branded Enviro400 City provincial specification buses had left the operator’s Rigby Road headquarters and assembled at their Starr Gate tram depot. 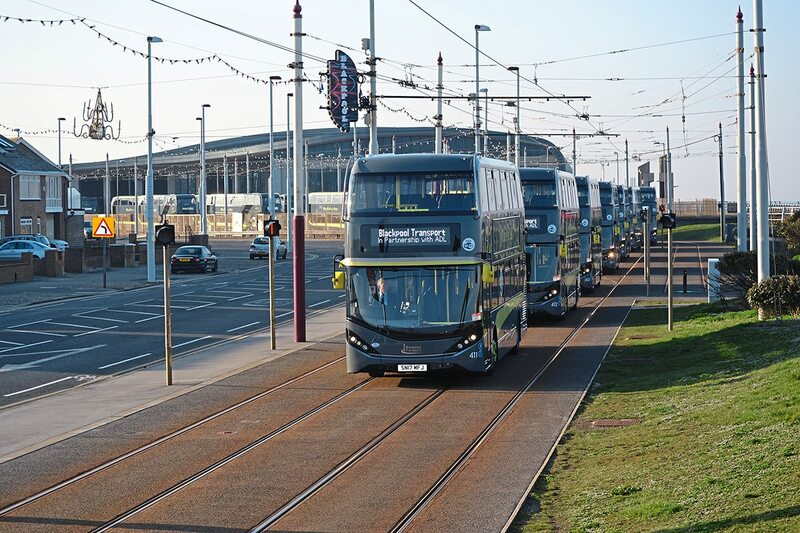 At 08.00, they left in convoy to travel along the tram tracks to the Comedy Carpet in the town centre. It was an impressive sight and well worth the early morning press call! The latest vehicles are part of MD Jane Cole’s commitment to upgrading the fleet of 140 vehicles to ensure that by 2020, no BTS vehicle is older than five years. 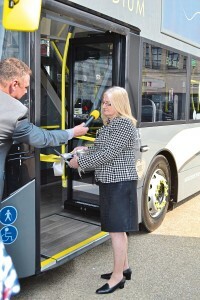 The Enviro400 City is an extension to the ADL portfolio, having been derived from their London specified hybrid City bus (Enviro400H City). Following the Enviro400 City’s adaption for BTS to a single door vehicle, the newly created Enviro400 City is now available to the wider market. 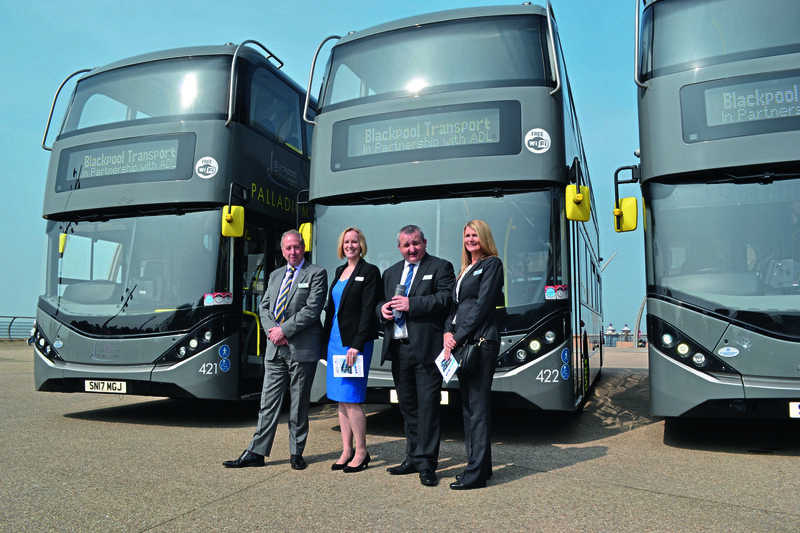 The 10.5m, 72 seat double decked bus is fitted with a Cummins Euro6, 6.7litre, six cylinder turbocharged and intercooled diesel engine, with a Voith D854.6 W53 gearbox, fitted with integral retarders and interlocks. The emissions package includes Exhaust Gas Recirculation (EGR), Variable Geometry Turbo (VGT), Diesel Particulate Filter (DPF) and Selective Catalytic Reduction (SCR). ADL have designed a spacious, comfortable, quiet and ergonomic driver’s cab, giving excellent forward vision enhanced by the use of a curved windscreen. The cab provides intuitive on board diagnostics via the driver’s screen. 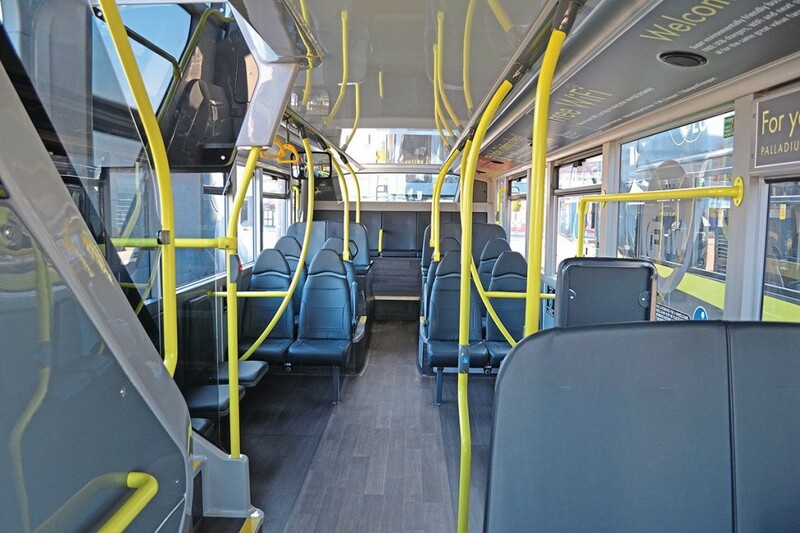 It has a Chapman driver seat and features an improved cab door following consultation with some of BTS’s drivers. Accessibility features include Electronic Levelling Control (ELC) and a fast-kneel facility on the front suspension, reducing the height from 325mm to 245mm. 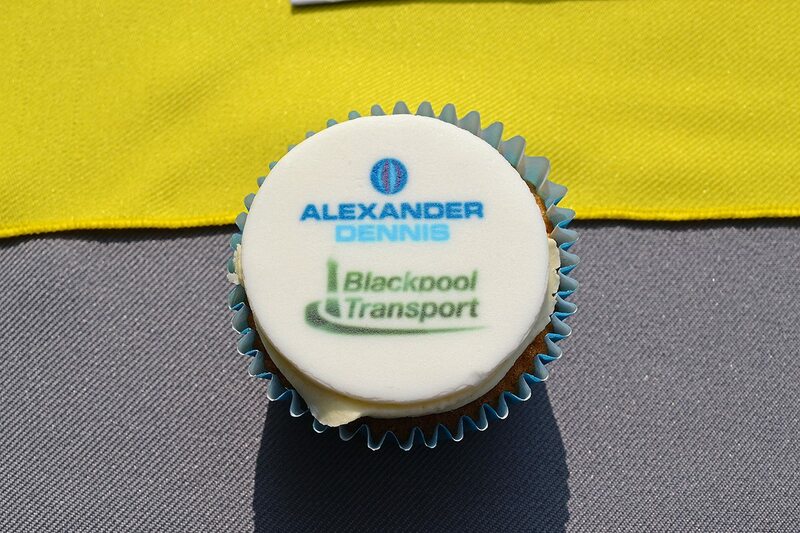 The vehicle is also fitted with ADL’s standard manual ramp. Continuous saloon lighting is provided by LED strips and LED lights are standard throughout the vehicle with the exception of the headlamps. The lightweight Isri Civic V3 Seats are trimmed in grey E-Leather. 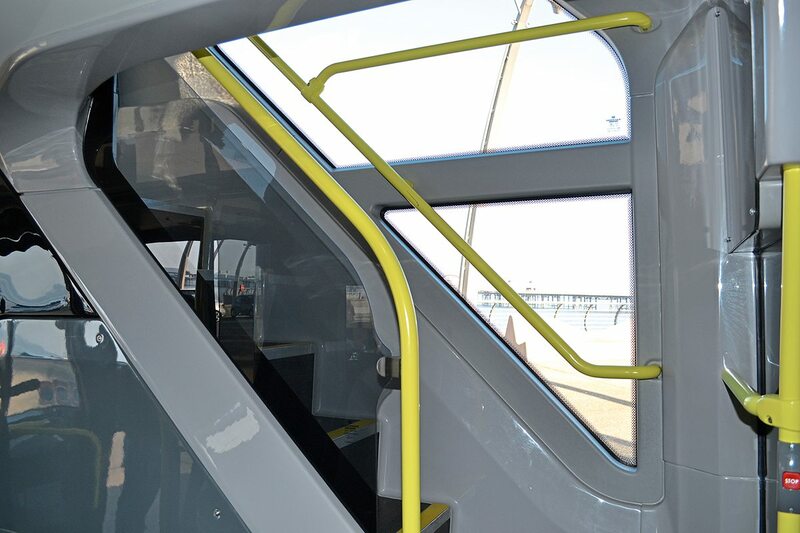 There are 43 on the upper level with 29 on the lower, with a dedicated wheelchair/buggy space. 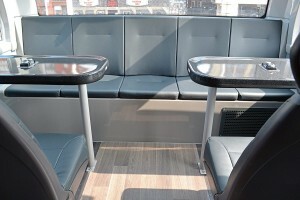 Three tables can be found on the upper deck, with two along the rear seating section, to provide a social seating area. This is complimented by a panoramic rear view window. 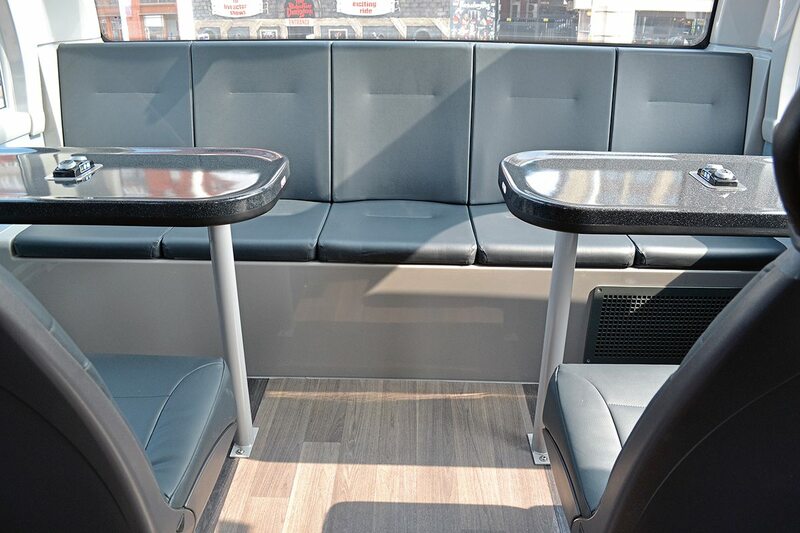 Each table has a bank of USB charging ports and USB points are fitted to the backs of the other seats throughout the vehicle. The saloon has two-tone wood effect flooring and the upper deck stairwell has a glass wall to provide a lighter ambience. Free Wi-Fi is provided throughout. 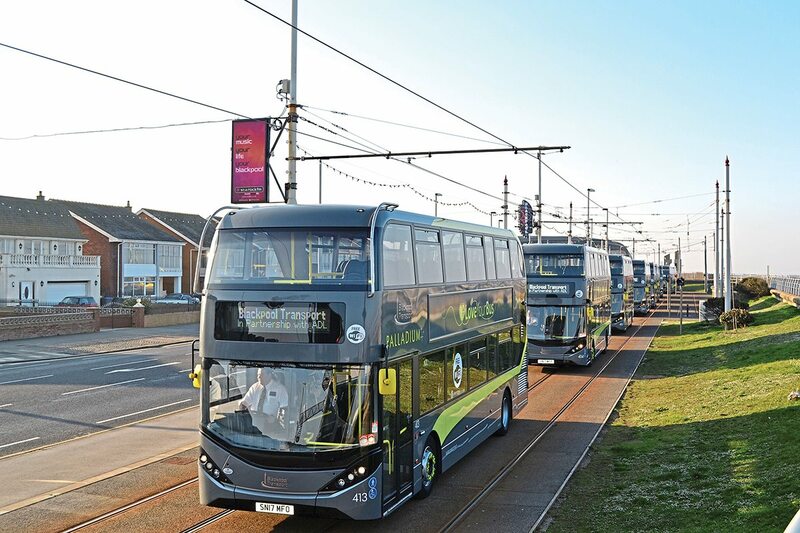 Mobitech supply the audio-visual next stop announcement system as well as their Ultima white destination displays which were programmed on the day to read ‘Blackpool Transport in partnership with ADL’. 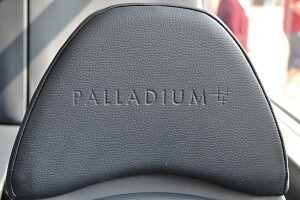 The LCEB compliant Palladium has a range of smart accessories, including batteries and alternator. It features an electric cooling system and is fitted with stop start technology. Synectics have provided the CCTV system, which consists of Synectics V400 recorder, 11 camera system with audio recording, HD front camera, reversing camera and driver’s monitor. 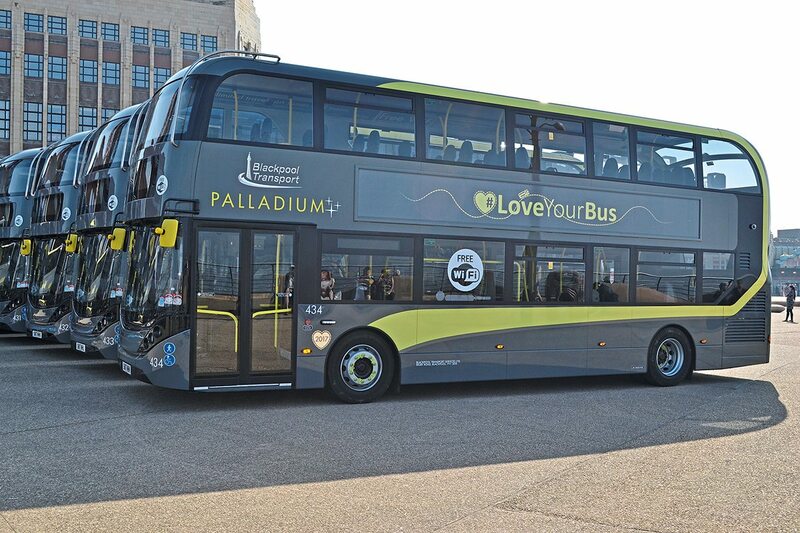 The 2017 livery has been restyled by Buzz Marketing with a 2017 silver heart by the passenger door and the message ‘#Love your Bus’ along the exterior advertising panel. 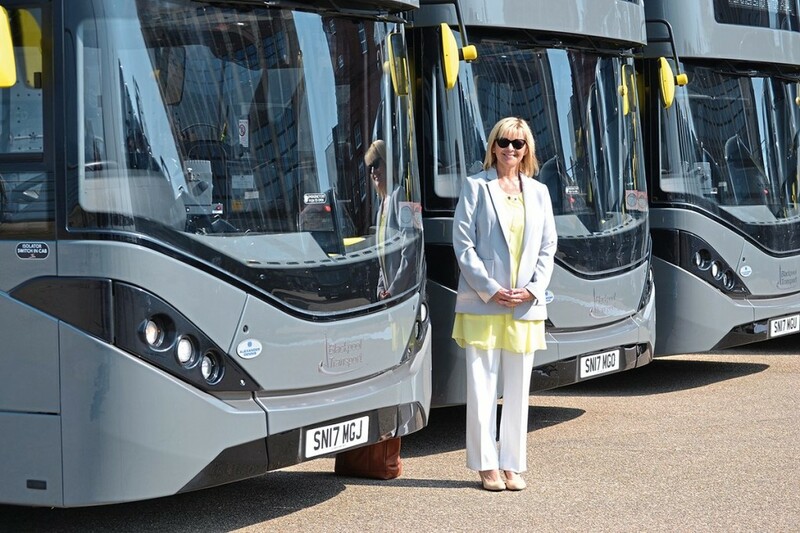 I asked Jane whether there might be a move towards electric vehicles and she told me that she expects the vehicles to evolve over the term of the contract and subsequent years, as passengers and legislation dictates. 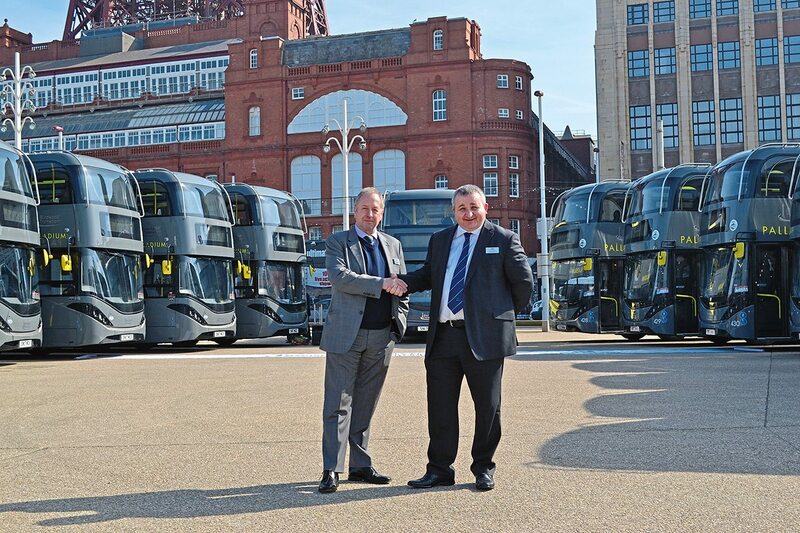 For readers attending the ALBUM conference next month, there will be the opportunity to ride and view one of the latest Palladiums, along with the ADL Enviro400 City demonstrator.